This game illustrates the importance of dealing with technical debt. Over the course of 10 sprints, a software development team will try to deliver as much software value as possible. The team can invest in measures that reduce the burden of technical debt. While there’s a short-term price, these measures also bring long-term benefits. Before you begin, download the ZIP file containing all the materials that you will need to print. Between 2 and 4. All players will be members of the same team, making decisions together. Printed copy of the rules. Printed copies of the scoring sheet and tracking sheet. More detailed instructions are available in the ZIP file. Here are the basics of playing the game. The team has 12 dice, representing the team’s capacity. Some of that capacity will be available to create new software value. Technical debt will consume the rest of that capacity. Every turn represents a sprint. 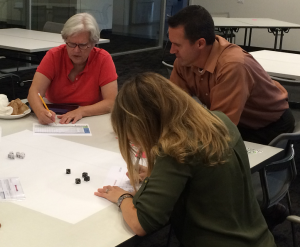 Each turn, the team rolls dice to determine how much software value they will create. First, roll the New Value dice. To start, the team has 8 New Value dice. Get the total from all the dice rolled. Second, roll the Technical Debt dice. To start, the team has 4 Technical Debt dice. Again, get the total. Subtract the Technical Debt total from the New Value total. The result is the actual amount of value created this turn. Before rolling the dice each turn, the team can decide to invest in measures that will reduce technical debt. Each measure has a cost, measured in New Value dice that will be unavailable for a number of turns. See the ZIP file for the costs and benefits of the four measures. Once the team has met the required cost (for example, removing 2 New Value Dice for 3 sprints), the team gets the benefit from the next sprint onwards. The team gets back the New Value dice invested in the technical debt-reducing measure. Each measure has a different benefit. Some shift capacity (dice) that used to be spent on technical debt into the New Value pool. At the end of 10 turns, total the cumulative value created across all sprints. That’s the team’s final score. The tracking sheet lets you compare your score to a baseline, representing the average score for teams that didn’t invest in any technical debt-reducing measures. Did you pursue a good strategy? Do you follow this strategy in real life? If not, what stops you from dealing with technical debt in the real world? How can you convince people that a short-term investment in technical debt reduction will have long-term benefits? What can you do to prevent further debt? Dice Of Debt is part of a packet of materials that the Agile Alliance has published to help software professionals understand and address technical debt. Click here to see the full set of materials.